Think Hyundai and 4x4 and you’ll most likely think of the firm’s Santa Fe, or more recent ix35 models. But if you’re on a budget and don’t need the vast size of the Santa Fe, the Tucson could be right up your street. First seen in 2004, the family SUV arrived with the firm’s excellent five-year warranty and a modicum of off-road ability. There’s also plenty of space, neat styling and an easy-going driving experience - the resulting popularity means there are now plenty to choose from on the used market. 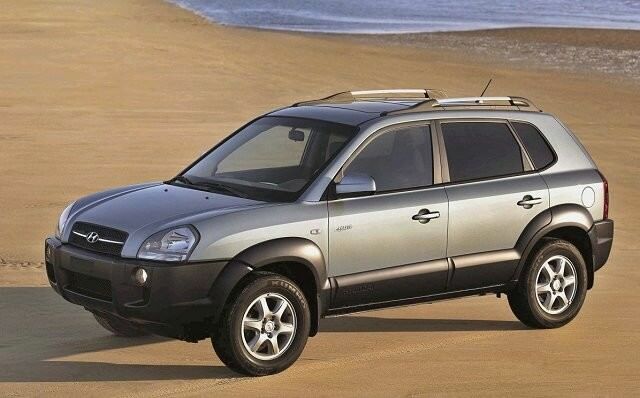 Only available as a five-door family SUV the Hyundai Tucson (later replaced with the ix35) is a practical and spacious family car that also came with a five-year warranty - pick a later model and you’ll still benefit from the cover. And while it’s not as capable off-road as a Land Rover product, the part-time four-wheel drive and lockable differential means it can handle more than most will throw at it. The choice of engines is rather limited; to two in fact. The 2.0-litre four-cylinder petrol unit offers the best performance but you’ll pay for it at the pumps. A much better choice is the 2.0-litre four-cylinder diesel, though it’s worth hunting out a post-2006 example as the power output jumped from 120- to 140hp, and the extra performance is notable. Fuel consumption on either is more than acceptable at around 7.0 litres/100km. Buyers had the choice of manual or automatic gearboxes, though the latter is only a four-speed unit and really saps the power. In truth the five-speed manual is far better suited to the rather basic and utilitarian character of the Tucson. Specification wise there were a number of trim levels sold - including CDX, Deluxe, Sport and GSi. There was also the odd limited edition thrown into the mix, so our advice is judge each car individually - no matter what model you opt for the basic specification will be generous. The 2.0-litre diesel engine may not be the most refined model, but as long as you can stretch to the more powerful post-2006 model the extra performance is enough to offset the gruff feel. Fuel consumption is acceptable and with the manual gearbox the Tucson feels like an honest and hard-working family SUV. We’d try for a Deluxe model if possible, as there are plenty to choose from and all come loaded with kit - the later the better as well as you’ll benefit from the balance of the five-year warranty. There’s definitely more stylish family SUVs out there (including this car’s ix35 replacement) but few offer as much value for money as the Hyundai Tucson. Spacious, practical and well-equipped the later models also offer the balance of the firm’s five-year warranty. Used values aren’t particularly strong, so you could find yourself in a much newer example than you might have first bargained for.